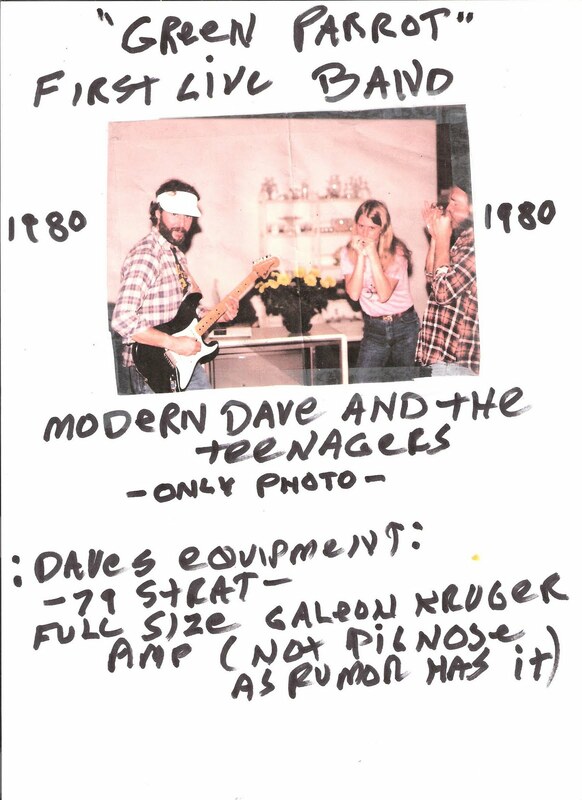 Here’s a photo, more like a flyer actually, that apparently percolated up from the bilges of Dashboard Dave’s archives, to be hand-delivered just today by Dave himself, touting, with all the subtlety of a ransom-note, Modern Dave and The Teenagers as the the First Live Band at The Green Parrot, dated 1980. 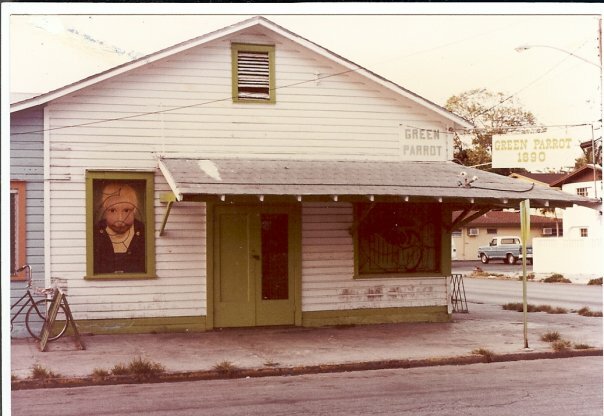 Although the photo was, in truth, taken in Key Haven and not in The Parrot, it’s provenance is undeniable. How so, you ask? Well, two of the three pictured, were in the bar today, to back their claim, to testify, to say “Damn right that’s us”. The two would be, on the left, Modern Dave, a.k.a. Dashboard Dave, pictured here in, as they say, happier times, before he became a duck-walking, bar-tending,air-guitar playing, bar-top-strutting, ceiling fan-casualty, and to Dave’s left one of The Teenagers, center-stage, our own hip-hugging, harp-wailing long-time retail manager, Helene. And finally, there’s Yeoman, the tragic note, pictured on the right, soon to be gone, shotgunned in the cab of his pick-up by his wife in the parking lot of The Key West Bar and Grille. 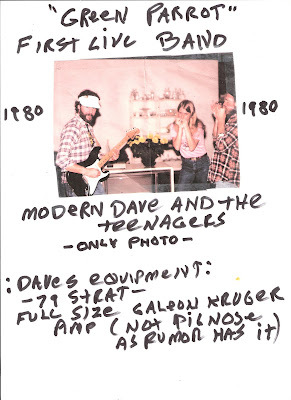 You gotta love how Dave boldly professes the rarity of the picture:the “only photo”, (more scarce even than Robert Johnson’s two existing photos) and next moves right on to crush the much-rumored-pignose amp myth. The Parrot of Modern Dave was The Parrot before the stage, The Parrot before the P.A., long before Fritz and Francois and even before Bean. This was Judy. Judy, the owner, who bless her soul, and bless her vision for this off-duval, post-navy, threadbare-hipster watering hole where 4 shots of tequila set you back a dollar, and a short 7-ounce draft was fifteen cents, Where if you walked in with a five dollar bill you were set for the night and if you were lucky enough to have a roach tucked up in matchbook you were golden. This was the year of Mariel, the year of Lennon, and the year Dave gigged at The Parrot, unpaid and truth be told, for the most part uninvited. The juke box was all 45’s, there was no TV, no ceiling fans, and when a decision had to be made where your last four quarters were going, four tequilas or some scratchy 45’s, well, pass the salt. So after getting behind a few bucks worth of San Mateus Silver, The Teenagers were not just a bargain, they were the bomb.